Behavioral medicine has now matured as a field to the point where all recognize that different populations are presented with different issues. Psychological reactions and patterns affect the health and well-being of children, as well as adults, and numerous standardized instruments for the assessment of a variety of areas of children's functioning are currently available. Yet, it can be difficult for practitioners and researchers searching through general compendia of resources for child assessment--which are frequently focused on general techniques rather than specific instruments--to identify the optimal ones to meet their particular needs and to choose among them. This practical and comprehensive reference guide is the first to sort, present, and review all the measures that can be used to evaluate the behavioral, cognitive, and emotional aspects of children's health. It organizes the measures under eight general headings, such as quality of life, adherence, pain management, and patient satisfaction. Each chapter begins with a leading authority's overview of the underlying theoretical construct and any concerns about how to measure it. Descriptions and reviews of relevant instruments follow; these include information on administration, scoring, psychometric properties, and ordering, as well as comments by the instruments' developers. 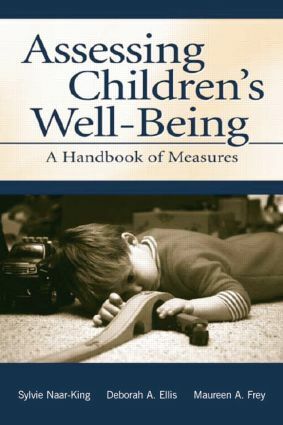 Assessing Children's Well-Being: A Handbook of Measures will be welcomed by all those professionals and scientists who seek to assess and effectively address the complex interactions between physical health and mental health in children. Contents: Preface. Health Status and Quality of Life. Adherence. Pain Management. Child Behavior. Child Development. Child Coping. Cognitions, Attributions, and Attitudes. Environment. Consumer Satisfaction. Appendix.